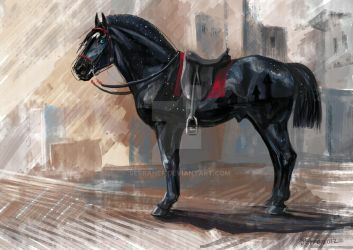 Nordanner is a fantasy breed of horse as part of HARPG on dA, though it can certainly be used outside HARPG. It was created by the royal court as a new and improved warhorse in response to terrible conflict. They have since moved to Aleria to start anew since the separation from their old home. Besides war, it is a versatile and very high-on-demand companion for dragon hunters. Want a Nordanner of Your Own? Nordanner is a closed breed. This means all starter horses are imported and not free to create. 1. Buy an existing horse, foal, or import from either group or private sales. 2. Get breeding spots with a registered mare and stallion to create a foal. 3. Visit our Nordanner Adoption Center and adopt one today! You can not design your own starter. You can not hire or request someone to create you a starter. You can not buy unused imports anywhere outside Nordanner group. Nordanners were originally bred as war horses, which were used to hunt and kill or capture wild dragons. When they had to leave their old world, they moved to Aleria and began again. Ready to become an official group member? You must own a Nordanner to become a member of this group. Until then, feel free to watch us! Just got one of your own? Leave us a comment on the front page with a link to your Nordy and we'll invite you straightaway. Want to Customize Your Nordanner? Free Potions & Aleria's Bubblin' Brewery for all of your other potion needs. Looking for even more information? Try our Breed Sheet Folder. Owning a Nordanner: Now What? Good question! Most importantly, you must register your Nordanner before you can breed, compete, or otherwise enjoy the group & our community. Check out the links below for information on registering, breeding, and designing your very own foals! Ah, now comes the fun part--enjoying your horse! Check out the links below to explore our Kaaring & Skill TreeReputation System and discover all the rewards you can reap simply by drawing your character. In the mood to draw something else? The Queen's Generals are always available for lease. Curious about the latest updates, changes or breaks? See the Group News journal. Need to sell something? You're welcome to try our Advertising Folder, but please be sure to read the rules before submitting. Have a few burning questions you can't locate the answer to? Give the Problem Solving journal a look-see, and if you don't find it there, drop us a comment! We're always more than happy to get back to you. Just submitted something? Here's an idea of how long it'll take to be accepted (and whether or not submissions are open!). Artwork: One day or less. Please be advised that response time tends to vary; in busy times it is not uncommon to wait 7 - 9 days for breedings to be processed. On the flip side, you will occasionally have 1 - 2 days or even less depending on our availability. As above, wait times vary depending on various factors, sometimes dropping to 2 - 4 days and occasionally reaching 2+ weeks. We are hoping to streamline this process sometime in the future, but appreciate your patience until then. Registrations: 1 - 3 Days. Though you will sometimes see this number jump to 5+ days, our volunteer admin team is hard at work looking over your horses. Ownership Transfers tend to follow the same pattern. Ah, but what's this? Aleria has her own currency in the form of Alerian Gold (AG). You can obtain AG through group hosted events, trading with members who already have AG, suggesting members to Nordanner Of The Month, donating to the Adoption Center and so much more! Gold is quite useful to have in one's pocket if you have the urge to shop! Are you having an issue with another member? Please see our Problem Solving journal to see what resources are at your disposal. Please keep in mind we are not the Gods of dA and cannot ban anyone from the site itself. In that vein, everyone has a Blacklist, and so do we. Take care not to end up on it! Looking for a certain horse or updating your lineage? Here's a handy list, just for you. Looking for something more to do? While the group hosts an RNG Mini Show and several other shows varying in size throughout the year, we also have introduced Quests to enhance and flavor our canon storyline. The Gods have returned, yet contact has been brief. Sporadic. And no explanation was given for their long absence. What does it mean...? The following links should tell you everything you need to know to participate! Quest Journal : Here, you'll find the current Quest. Indeed, traveling to Aleria was no easy task, nor does it seem the peace we found will be long-lasting...things are changing, and what is to come is anyone's guess. Luckily, we also have Familiars to help us along the way. And, if you're lucky (or hideously unlucky) you might consider calling on the Gods themselves. Perhaps they can spare a Blessing (or a Curse) just for you. Here, you'll find literature and stories conveniently grouped for your perusal. Just joined, or need to catch up? It's one-stop-reading! Stop, Hey, What's that Smell? See something around the group you think would benefit from a little tweaking? (Possibly with a sledgehammer? We don't judge.) Check out the Suggestion Box and let us know--many suggestions have been implemented over the years, and we all enjoy reading them. Last but not least...looking to spread the love? Visit us at NordyNoms and get an instant dose of good karma simply by telling us who you love, and why they're so gosh darn loveable. Nordanner imports can only be created by Cloudrunner64 and associates. While we are the process of coding our new page, how would you like our front page to look? Is there a way/reading thing to learn how to do this kind of HARPG stuff? Can I make a new registry for her on my account?? Just in case that one gets lost?? Yes! That's your next step -- get her registered! 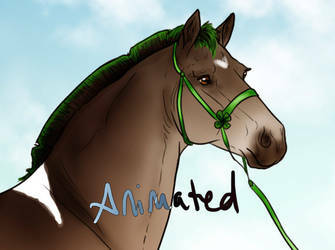 But you're also going to have to transfer that foal design over onto the new lines -- I'll note you with specifics. Hey there! I have a Nordanner (foal design here: A6411 Nordanner foal) but I cannot submit the design to the group's "Foal designs" folder, so I figured I need to be a group member first? Your invite has been sent! Let me know if you don't see it!